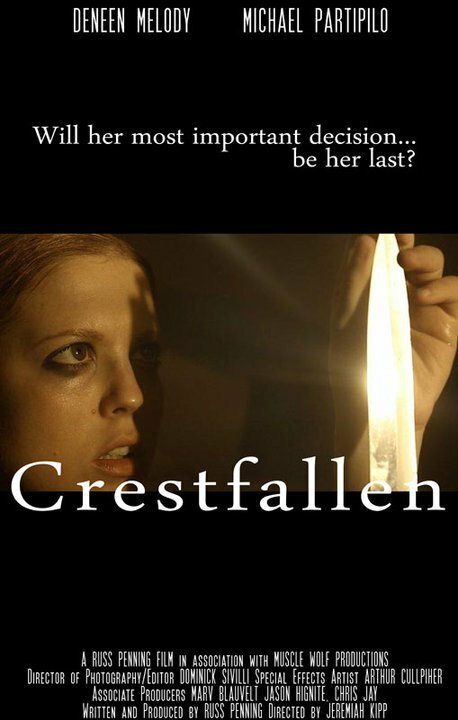 Crestfallen tells the tragic story of Lo, a young woman who finds herself unable to deal with her husband and best friend’s betrayal. She can’t deal with the pain any longer so she decides to end her suffering by killing herself. Lo slides in to the tub one night with a knife at hand as all of the memories of the past come pouring back to her. Writer, Russ Penning, really reflected the pain and anguish going on with this woman. It’s more difficult to write a script with little or no dialogue, but I always respect it when one is done right. 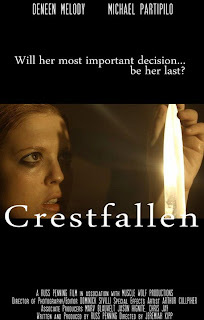 Although there are many interesting dynamics and insights that can be brought out through dialogue, it’s films like Crestfallen that can help remind you that at its core filmmaking is a visual from of storytelling. 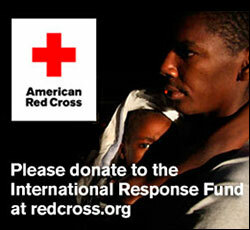 Without one word we completely understand this heartbreaking tale. While there is a beautiful story here, I could see Crestfallen not having as much of an impact as it does without the visuals and sound; the two areas of the film that truly shine. The beautiful imagery commands the audience’s attention and the score makes us hold on, already feeling so invested in the characters and their world. DP, Dominick Sivilli, did an outstanding job. The entire film is full of striking images, both of light and darkness, bringing out the appropriate balance for the subject matter. Of course the man I really need to single out is director, Jeremiah Kipp. I was really impressed with his very stylistic short, Contac. After Crestfallen it is clear he is just an impressive filmmaker; this is the standard he brings to the table. Kipp really brings all elements together; heartfelt performances from his actors, a disquieting and troubling tone, and the right atmosphere to let the story not only be told but experienced.